One of my favorite websites is Har.com, the website for the Houston Association of Realtors. It's great for browsing the insane variety of dwellings for sale in Houston and vicinity at any given time. For example, the cheapest house for sale right now is this one--yours for $5,900. The realtor gamely describes it thus: "HIGHLY VALUED THREE BEDROOM, ONE FULL BATH HOME IN GREAT NEIGHBORHOOD." And then there's 511 South Post Oak. 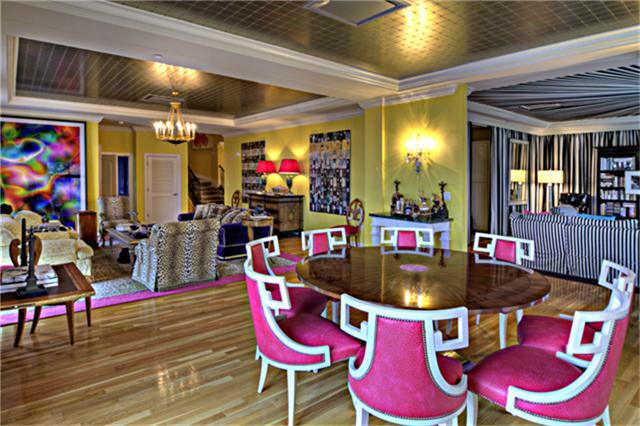 This condo, apparently owned by Valerie Sarofim, former daughter-in-law of Fayez Sarofim, is decorated in a highly individual (one might say over-the-top) manner, which caused the timid taste arbiters among the Swamplot commentariat to collectively clutch their pearls. But what fascinated me was seeing the art on her walls. 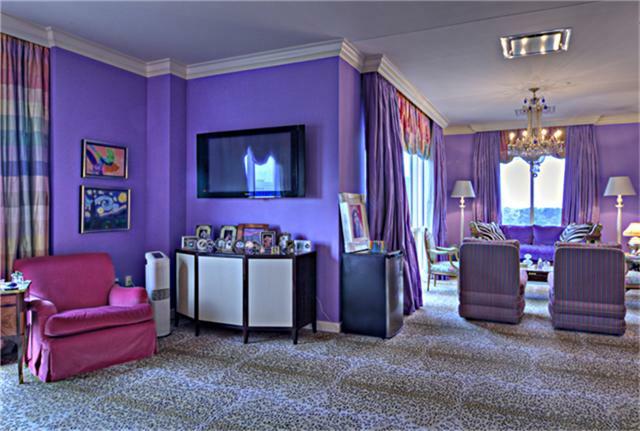 I always look to see what kind of art shows up in these real estate photos, and I've decided I'll share some of them with you in the form of a quiz. 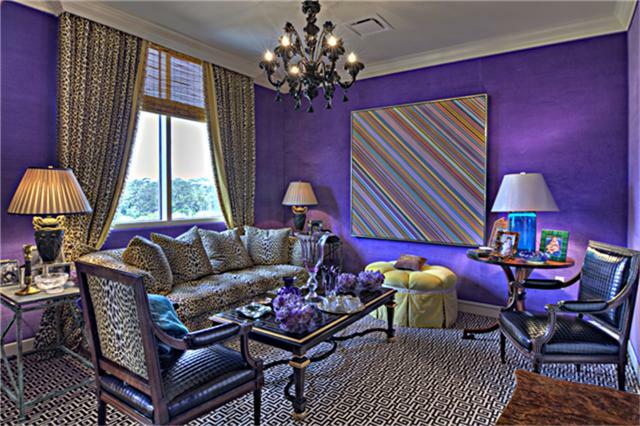 Can you identify the art in this home for sale? Now it's not surprising that the former daughter-in-law of a famous art collector would own some art herself. So the object of this quiz is for you to identify the art in Valerie Sarofim's condo. I'm going to take the first guess. I'm pretty sure the painting hanging on that purple wall is by Rob Reasoner, who specializes is supercolorful striped paintings. Reasoner has a nice show up right now at McClain Gallery through August 24, so you can check out his art in person if you like. There is the big colorful picture on the left and the pair on either side of the red lamps. Any theories on who the artists are? Of the two pictures on the right, the bottom looks just a tad familiar. But what about the one above it? Here's another view of those two paintings. The bottom of the stairs has an intriguing piece. And then there is that series in the stairwell. Here's a better view of the stairwell pictures. So, given this real estate photographer's view of the inside of Valerie Sarofim's condo, do you have any guesses about the identity of the artworks and the artists who made them? Put your answers in the comments. 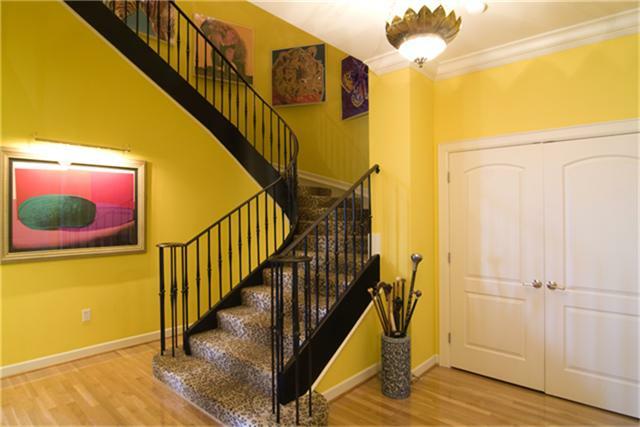 And if enough of you like this feature, I'll try to run it semi-regularly--at least, whenever I notice a house for sale with interesting art in it. I don't have any idea whose art is on those god-awful walls, but I love the idea of this being a semi-regular series. 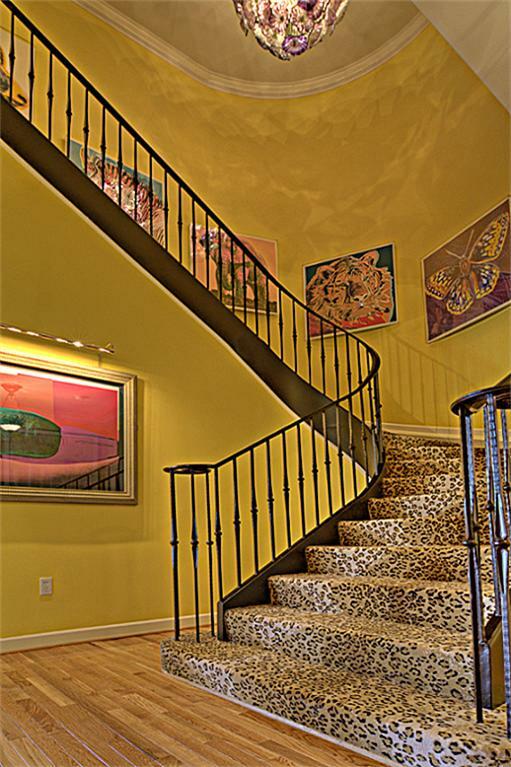 The ones in the stairway are Warhol: Tiger, Elephant, Zebra, and Ram. Not positive about the Butterfly. It's also Warhol--they are all part of a series of silkscreens he did of endangered species. The "colorful picture to the left" is a Thomas Ruff print. a little Google confirms it--it's one of his "substrats" series. C'mon. It's not fair to try to make us guess the artists when the color palate of the joint is making our eyes bleed. Not likely to find much art in those "under $20K" houses. But that's what I like about HAR.com--it permits you voyeuristically to look into other people's houses, rich and poor alike.